I reckon one of the main ways to cut our food bills in February is to actually eat the food we buy, rather than binning it. But the stats from the Love Food, Hate Waste campaign are shocking – that we throw away 7 million tonnes of food and drink from our homes every year. This costs £12.5 billion a year, before you even consider the environmental impact. Ouch. So I’m currently feeling sumg because during the first three days of February, we’ve managed to use up three of the abandoned ingredients identified in yesterday’s post about the stock take. 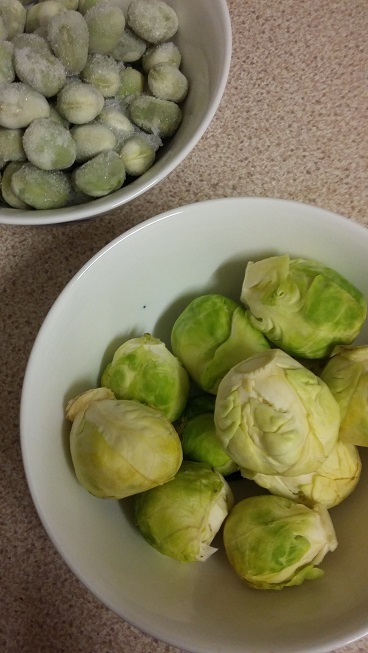 As a tiny contribution to minimising food waste, we’ve eaten the brussel sprouts left over from Christmas, the turkey drumsticks languishing at the back of the freezer, and the celeriac abandoned in the fridge. Here’s an example of the kind of food we’ve been eating, starting with the first day of February. I kicked off my attempts to eat more healthily while spending less with a go at overnight oats. 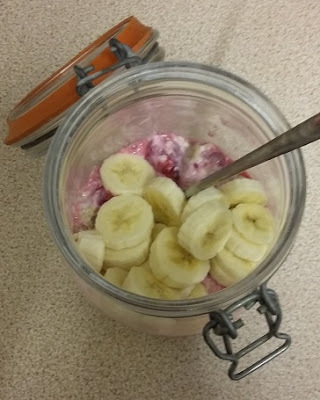 Eating food layered in jars seems to be a thing nowadays. The photos always look great, so I gave it a whirl, partly because I’d seen a combination that would help use up some of the frozen raspberries in the freezer. 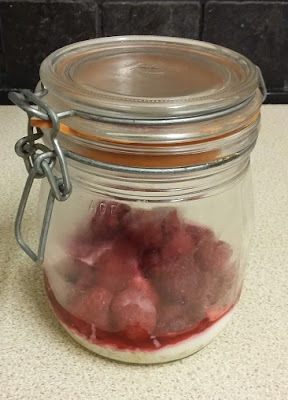 I followed the instructions about adding 30g oats, 60ml skimmed milk, 60g low fat natural yogurt and 100g raspberries and bunged it in the fridge overnight, but mine was rather less photogenic. Perhaps a smaller jar next time? It really was quite tart, but was improved by chucking in a chopped banana. I still can’t get my head round eating cold oats though. Surely the point of porridge is that it warms you up? Many things can be improved with the addition of chopped banana. Lunch involved using up some carrots, an apple, part of a lettuce and some soft cheese, with soup and a sandwich thin resurrected from the freezer. Soup, salad, sandwich – lunch, done. 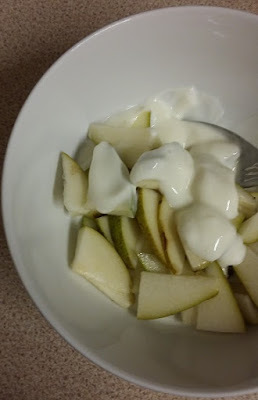 I survived the afternoon buoyed up on more of the natural yogurt and pear, plus a crumpet. I keep the crumpets in the freezer, in an attempt to stop myself from eating from one of the packet to the other. I’ll admit that dinner was slightly odd. My husband was off out bowling with his workmates, so I gave the children spaghetti with pesto and broad beans from the freezer. 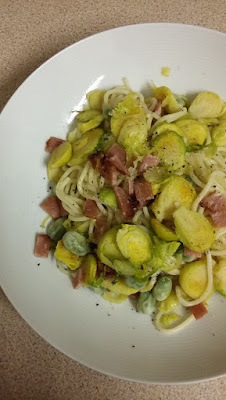 I diverted some of the spaghetti and beans to my own meal, with the addition of the last of the Christmas brussel sprouts sliced and fried with some leftover bacon. from the Brussels sprouts, they were fine. Brussel sprouts and bacon is a great combo, but in all honesty I wouldn’t encourage you to add them to spaghetti. Broad beans, brussel sprouts and bacon – good. By day 2 I was already back to my trusty porridge with chopped banana for breakfast. 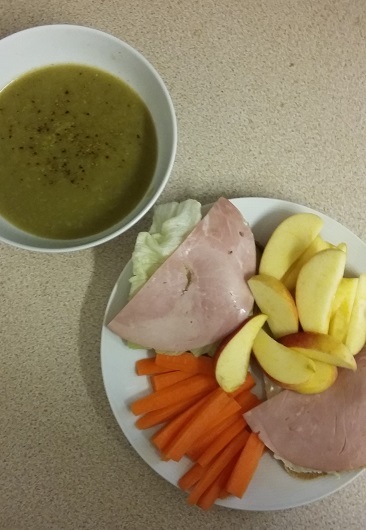 Lunch was a repeat of the soup / sandwich thin / salad / fruit combo to use up the other half of the broccoli and cauliflower soup. 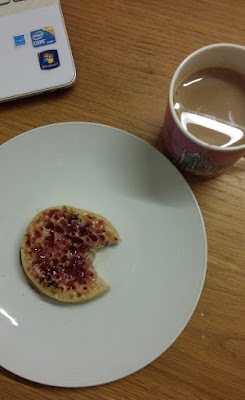 Snacks were similar too – yogurt with reduced price cherries, and another crumpet with jam. The children got to eat speedy ham and cheese sandwiches before we dashed out of the door to Beavers and Brownies. Later in the evening however, I finally faced up to the turkey drumsticks frozen since Christmas. I’d bought some half fat creme fraiche and a bag of reduced price mushrooms. 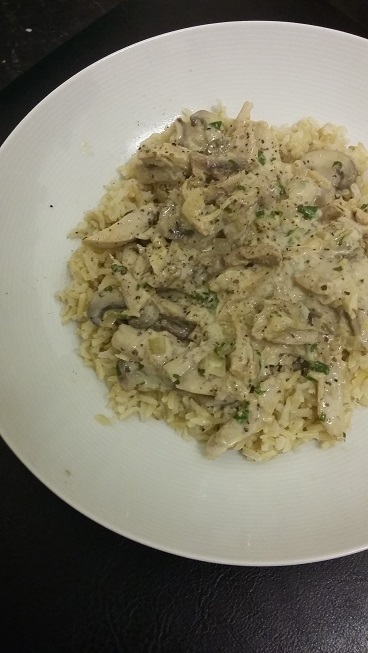 This meant I could cook the turkey and mushrooms with stock, lemon zest and parsley from the garden, then mix in some of the creme fraiche with grain mustard and lemon zest to make a creamy sauce. We ate it with brown rice and much appreciation. in a creamy mustard sauce, with rice. Breakfast was the old familiar porridge and chopped banana. For lunch I hardly had time to hurl some tinned sardines from the storecupboard on a sandwich thin, let alone attempt my grand plan of making more soup. There’s always tomorrow. After school I made the the children mini toad in the hole with the frankfurter sausages my daughter insists on, accompanied by cooked carrots. 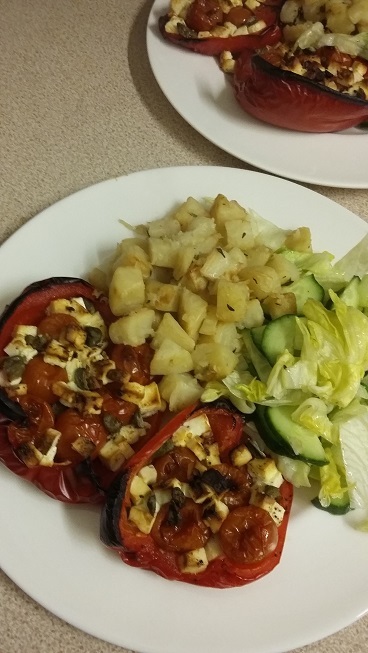 Then this evening I tried a new recipe, involving roasted red peppers stuffed with feta (well, Morrisons savers greek style cheese, but it’s a bit less snappy), cherry tomatoes, capers and chilli flakes. I finally faced up to the celeriac, and tried out this Jamie Oliver recipe, even though it refers to “smashed” celeriac. As an added bonus, it used some of the fresh thyme left over from cooking the turkey at Christmas. With the addition of some green salad (lettuce, spring onions, celery and cucumber and an olive oil, white wine vinegar and Dijon mustard dressing) it received the ultimate accolade from my husband: “You can do this again”. Praise indeed. Roasted red peppers with feta and cherry tomatoes, smashed celeriac and salad. So a good start to using up some of the long-abandoned ingredients in the house, as we attempt to cut our food bills during February. Hopefully tomorrow I’ll be able to update on how (not to) go shopping. Well done, you! Don't you just feel like a Rock star when you find creative AND Approved ways of using up leftovers? I know I do. I recently turned a fading box of rocket and so wilted coriander into a pesto sauce and I was so pleased! Definite feeling of virtue at using up ingredients that would otherwise head for the bin! Soup is such an easy way, but it's nice to find alternatives. We've been doing the same as this in January and will continue in Feb. I found some chopped Bramley apples in the freezer from 2011! – they were fine stewed with a little bit of brown sugar (small packets acquired by husband during hotel stays) and mixed spice 😀 I also have some pears in there of the same date…. Love the concept of freezer tetris. Sounds like you are doing really well with your food shopping. Good luck with the teenage sleepover, I'd be quaking in my boots. I tried the old 'soak your oats overnight with some grated apple and assorted other ingredients' thing … and ended up with unappealing wet appley flavoured oats when a steaming bowl of porridge with a spoonful of stewed apples would have so much better!! So true! I much prefer porridge warm.